After last weeks discussion about the how ideas of affect and semiotics within artwork create reactions in the viewer, it seems fitting this week to write about my visit to Ante Art in Shipley. Organised to coincide with the annual May Day celebrations (otherwise known as the International Day of Workers), Ante Art expresses a DIY aesthetic coupled with a strong political agenda. As a completely self-organised and unfunded event produced through collective effort, it showed what can be achieved through the use of our own talents and in cooperation with others. 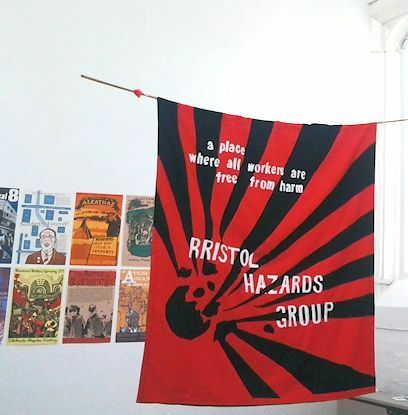 The exhibits ranged from union banners and archives of posters from the 80s, through to contemporary art practices using crowdsourced methods of production, such as Twitter. Art practices which incorporate elements of protest (or vice versa), typically wear their heart on their sleeve, but they can also run the risk of being equally as polemical as the capitalist model. In other words, visual art practice as a tool for critical thinking is often at odds with agitprop style work, which is intended to convey one specific message to the audience. This work, often described as Culture Jamming, tends to appropriate and subvert the language and aesthetics of advertising in order to question these messages, and is popular among street artists such as Banksy and publications, such as Adbusters. However, my assessment is not intended to deride these practices, but as a further exploration of what constitutes ‘art’ as opposed to protest. In considering the relative merits of these actions, it may then be possible not only to define the boundaries of each term, but also how each may contribute to the effectiveness of the other. In fact, throughout history, artists have used their work in order to question and expose ‘truths’ in a manner akin to protest. The contemporary Chinese artist, Ai Wei Wei, now famed for his illegal detainment due to speaking out against the actions of the Chinese authorities, is one such artist. His work, like many artists, is produced by a team of skilled crafts people under his direction. However, rather than the traditional capitalist factory, the political messages within his work seem to almost incorporate this process as a collective effort. His work is imbued with social activism, but through a process of embodying these experiences, it becomes less polemical and more autobiographical. Equally, the installations, despite drawing on his experiences of protest, are not obviously propagandist, and require additional context in order for all the meanings to be fully understood. This context is provided in the form of online videos, tweets, interviews and films. So what could art as protest be? Perhaps the most interesting way of thinking about it is to return to ideas of how art is exhibited and received and the role of the artist within these structures. As a maker of cultural products, one of the ways to make your voice heard is through non-participation. Lauren van Haaften-Schick writes in ArtLeaks Gazette about instances where artists have refused to participate in exhibitions and opportunities, sometimes even removing their work from display in museums as a protest about freedom of speech or the political motivations of institutions. Again, although these actions can appear self-defeating, it does suggest other ways of engaging in creative practice as a political act. The exploration of protest is continued through the work of London-based artists Karen Mirza and Brad Butler. As a multi-layered installation consisting of film, sound, text, and performed actions, The Museum of Non-Participation creates a format with which to explore the ways in which people can participate in or withdraw from political realities. Working within the gallery system, yet critiquing the idea of collections and institutions begins to question the underlying structures that produce the art system, thereby creating new possibilities and ontologies of interaction. In contemplating the idea of a work of art that mirrors a ritual object, I’m once again drawn back to considering what the definition of a work of art would be, not just in the modern ‘Western’ sense, but, dare I say, as a universal classification. I’ve decided to tackle this by defining how an object might convey its meaning, starting with ideas around the agency of art (discussed in week 11). Alfred Gell, a keen proponent of art as defined by the agency of an object, rejects the idea of a purely symbolic meaning of art where ‘artists are exclusively aesthetic agents, who produce works of art which manifest their aesthetic intentions… which spectators have to decode on the basis of their familiarity with the semiological system used by the artist to encode the meaning they contain.’ In other words, he dismisses the idea of art that functions purely through signs that need to be understood by an audience, in favour of one that expreses its creators social agency in producing the object. However, although this is a useful starting point for considering the affective qualities of an artwork, it does not account for cultural significance. Furthermore, this definition incorporates many more objects from material culture under the umbrella of art, and therefore requires further differentiation. For these reasons, it is worth considering the nature and function of the sign in order to determine which elements might contribute towards a definition of art. The study of the sign, also known as semiotics, had its beginnings in 1690 with John Locke, but began to develop in the 19th Century with Charles Sanders Pierce, followed by Ferdinand de Saussure. Saussure’s ‘semiology’ linked signs to social life as a way of communication and differentiation between ‘things’. Saussure considers a sign, for example the written word ‘tree’, to consist of a signifier (the spoken word pattern of ‘tree’) and a signified (the concept of a tree). However, even though these two elements are inseparable, he also claims that this relationship is arbitrary and purely based on cultural convention, ie. there is no similarity between the idea of a tree and the sound that expresses that idea. Nevertheless, once that relationship is established, it is maintained by the concept of difference (the word for the signified tree is different to the concept ‘flower’ or ‘bush’). Yet again, however, the concept of the art object as a singular sign defies definition, being as it would then also be made up of a network of possible signs, each of which would rely on cultural convention to be understood. Such an arrangement can be seen in action through the combination of branding and marketing, where a brand logo stands for the qualities expressed in the marketing and continues to represent those qualities after the fact. These kinds of conceptions of the way that the work art functions have a distinctly closed commercial system, which is reflected in the capitalist art market, but is far from sufficient in terms of a means of classification. Furthermore, these definitions serve to distill the art making process into purely economic terms. In the a-n article on artists livelihoods, Tim Stoner writes “I became very cynical after winning Beck’s Futures, because the art-world-economic expectation was to continue doing the same thing so that I could feed collector demand”. Therefore, it seems reasonable to suggest that art requires a combination of affective and semiological or aesthetic qualities, in order to convey a message. Of course, this is a long way off from distinguishing art objects from other objects in a universal sense, but it begins to address some of the separations between things and their meanings. Despite all the hard work researching, writing and making, there are still lots of opportunities to explore and travel which come out of the PhD. This weeks adventure came courtesy of the Fruitmarket Gallery in Edinburgh, who’d put a call out for exhibitors for their third Artists book Fair. Throughout the day, the gallery would be transformed into a market full of stalls, workshops and talks by artists from all over the world. I’d first become acquainted with the gallery the previous summer after travelling up to the Edinburgh Fringe. There was an excellent exhibition of Dieter Roth which covered both floors of the gallery, and contained a bank of monitors detailing each of the artist’s working days. Upstairs was an archive of rubbish collected and catalogued by the artist, alongside a video of him discussing occasions of being stopped by customs with suitcases full of rubbish. I found the curation and architecture of the space very inviting and well laid out. However, the thing that really impressed me was walking back through the bookshop part of the gallery and realising that they had a section especially for artist books! A short conversation later and I found out that not only were they planning an event for the coming year but they knew my supervisor too. Small world! I’d previously had the idea to create a new artist book exhibition around the theme of instructions, to explore how the audience might be incentivised to interact with the artwork. I approached the gallery with the idea and they told me that they couldn’t accommodate an exhibition, however they were really interested in having me curate a stall for the Artist Book event. I set to work putting the call out to my networks and had a good response, which resulted in finished works from 8 artists, as well as a further one which didn’t make it in time. This work was by Heather Matthew, who I wanted to mention even though her work wasn’t on show, due to her extraordinary efforts to create and send the work all the way from Australia. (I’ve promised her another project in future so hopefully I can make that happen soon). The artists in the show were Craig Atkinson, Black Dogs, Manya Donaque, Alex Hetherington (Modern Edinburgh Film School), Benedict Phillips, Louisa Parker, Archie Salandin, and myself. 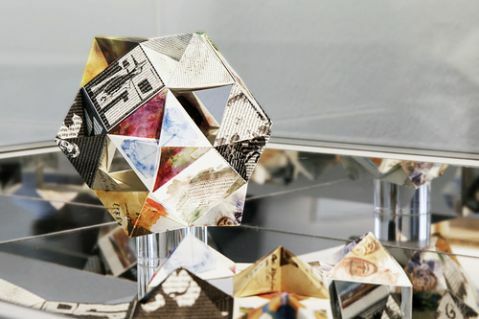 The curatorial brief was inspired by Fluxus, mail art and relational practice, so each artist provided book works which were loosely based on the idea of a guide, almanac or puzzle. A full list of images and text can be seen on the ABC archive page. The Saturday arrived and, having travelled up the day before, I was refreshed and raring to go. There was the usual mix of artist books, fine press, handmade journals, independent publishers and poets. However, it took me a while to realise that a couple of stalls next to me was Alec Finlay. This might not mean much to you if you’re not an artist or a poet but I have been in awe of his work since I first saw it in the Northern Art Prize in 2010. I have to admit, I got a bit starstruck but he was very friendly and even agreed to discuss his work with me for my future research. The other contribution I made to the Book Fair was a talk about the history of the Artist Book Collective. I’d previously delivered a similiar one in Leeds, and though I was a bit nervous, I soon felt able to relax. The room was comfortable, and even though it was a fairly small audience, everyone seemed to enjoy it and asked questions afterwards. I definitely felt that it was a good way to develop my presentation skills. All in all, it was a successful weekend, with sales and new contacts made, and books purchased. I’m looking forward to the next one. Plus, at the same time that I was up in Edinburgh, my work was also down at BABE in Bristol courtesy of the fantastic AMBruno group. Artist books are definitely a good way of distributing your work. Last week I discussed how I’m expected to complete a transfer process in order to progress to the second year of the PhD. It still feels quite intimidating, as it’s essentially an assessment of my work to date, but thankfully the university provide training in order to find out exactly what is involved. These training sessions also contribute to the overall assessment of your research capabilities; what we in the visual arts refer to as CPD (or Continuing Professional Development).It’s always a good idea to take advantage of these opportunities as they not only help you to understand academic processes, but also show potential assessors and employers that you are capable of working in a research environment and managing your own training needs. The TDNA tool on the PDR (discussed in Weeks 4 & 6) comes in handy for determining which skills might need to be developed. What is examined and how? The assessment takes place between 9 and 12 months of starting the course, in the form of a viva and a submitted research document. For practice-led candidates, the research document contains a written essay detailing your interests and findings, and evidence of creative practice. In addition to this, the candidate should provide evidence and confirmation of academic integrity in relation to plagiarism, safeguarding data, and research ethics. The assessors are usually made up of a panel of your supervisor(s) and another person who is internal to the university but external to your project. The viva is short for the Latin ‘viva voce’ and is essentially a verbal defence of the written document. The combination of written and verbal information gives the assessors an example of how you think and helps them to establish the probability of the project being completed. The project criteria includes proof of originality and independent critical ability, as well as the potential for publication. The presentation of the written work and verbal skills is also assessed as part of the process. This all seemed fairly straightforward to me, with the exception of what constituted originality. After all, if the project relied on referenced evidence supporting your findings, how could it also be original? As a key assessment criteria, it is useful to understand and discuss what constitutes originality within research. These definitions are varied and dependent on the specific research area, but can include; the development of a new product, theory, or perspective produced as a result of research, an improvement on something which already exists, the reinterpretation of an existing theory or the application of an idea to a new data set to produce new research tools or techniques, a critical analysis of someone else’s work, or a portfolio of work which demonstrates contextualisation and competence in the subject area. As a visual artist involved in the creation of new cultural products, it is fairly easy to prove originality through sketchbooks and records of thought processes. However, it was also useful to consider this point with respect to the conceptual element of the research. After considering the content and presentation of the research project, another major factor to be assessed is the structure. Candidates will also be expected to pin down specific research questions along with a timescale, in order to determine the scope and quality of the project. This allows the assessors to decide whether the standard of the project is suitable for PhD level, as well as whether it is achievable within the time available. Although the process seems quite scary, it’s useful to consider it as an opportunity to reflect on your research and to get advice from people outside the project. It’s also a good deadline to work towards in terms of creating a firm foundation for your main PhD research, as well as an opportunity to experience the viva process, which you will need to undertake again at the end of the project. I have quite a lot to do before transfer, but I still have a couple of months to go, and now, a list of what I need to do as well.